William Happer is the Cyrus Fogg Brackett Professor of Physics, Emeritus, in the Department of Physics at Princeton University. A long-time member of JASON, a group of scientists which provides independent advice to the U.S. government on matters relating to science, technology, and national security, Happer served as Director of the U.S. Department of Energy’s Office of Science from 1991–1993. Best known to the general public as a vocal critic of the U.N. IPCC “consensus” on global warming, he has been called frequently to give expert testimony before various U.S. congressional committees on the subject of global warming (climate change). In 2015, he found himself at the center of a new controversy involving a so-called “sting” operation organized by Greenpeace. A list of some of Professor Happer’s major research publications may be accessed here. Professor Happer: Thank you very much for agreeing to this interview, and to participate in the upcoming Focused Civil Dialogue on global warming with the Australian physicist, David Karoly. The global warming controversy is both exceedingly complicated and highly charged emotionally. Our goal in these interviews is to lay the groundwork for a productive Focused Civil Dialogue between you and Professor Karoly. 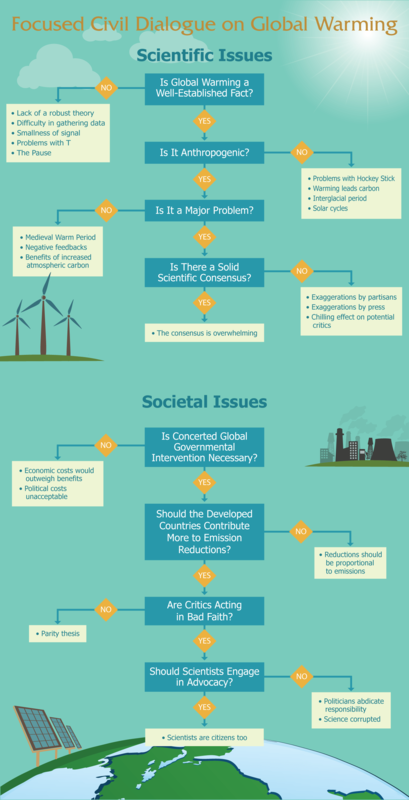 In this interview, we will explore the issues from a number of different angles, both scientific and political (see the flowchart below). However, before turning to the substance of the interview, we would like for you to tell us a little bit about your personal story. When and where were you born? What were your parents' occupations? What was your religious upbringing, if any? Where did you obtain your education? What made you interested in a career in physics in the first place? Anything you’d like to share with our readers, to give them a sense of you as a person, would be greatly appreciated. I was born on 27 July 1939, in Vellore, India. My father, also Dr. William Happer, was a Scottish medical officer in the Indian Army, and my mother, Dr. Gladys Morgan Happer, was a medical missionary for the Lutheran Church of North Carolina. On one September, a month after my birth, World War II began with the invasion of Poland by Nazi Germany and its ally, the Soviet Union. Britain and France immediately declared war on Germany in support of the poor Poles, the first victims of the Molotov-Ribbentrop non-aggression pact. The United States remained aloof and there were even suggestions by prominent Americans that we cut a deal with the Nazis and divide up the British Empire with the Germans and Japanese. Before my first birthday in India, the French, who had taken the brunt of the Nazi onslaught, made peace. This left only Britain to face the Nazis and their Japanese allies. At the time, there were fears that the rapidly advancing Japanese would soon seize India, so early in the year 1941, my father put me and my mother, pregnant with my brother Ian, on a ship bound for America. Our ship sailed around the southern tip of Africa and up the coast of South America to avoid the “wolf packs” of Nazi submarines that were devastating British shipping. We were fortunate to reach the USA safely, and my mother’s parents welcomed us into their home in Salisbury, North Carolina. My father and his Indian Army unit were sent first to Iraq, where the government had declared its support for Hitler, and then to Egypt to help oppose Rommel’s advance across North Africa. My mother’s brother, Karl Ziegler Morgan, was one of the first physicists to join the Manhattan Project in Oak Ridge, Tennessee. Karl was responsible for protecting the workers at Oak Ridge from radiation hazards, and he is often called the “father of health physics.” He knew a lot about nuclear physics, but little about medicine, so he persuaded my mother to join him in Oak Ridge as the first doctor at “X-10,” now the site of the Oak Ridge National Laboratory. More about my mother, Gladys Morgan Happer, can be found in the book, Their Day in the Sun: Women of the Manhattan Project , by Ruth H. Howes and Caroline L. Herzenberg (Temple University Press, 2003). A preschooler, I went with my mother to Oak Ridge, then a closed city of hastily erected barracks, board walks, muddy streets, and tight security. But I was able to observe scientists of all stripes…. most importantly, my physicist-uncle, Karl Morgan. He served as a father figure during the war when I did not know if my real father was alive or dead. It was this experience that convinced me that a career in physics would be wonderful if I could measure up to what was required. Fortunately, my father survived the war and brought us back to India, where we remained until 1948. I went to the International School at Kodaikanal, at an altitude of about 7,000 ft. in the mountains between Tamil Nadu and Kerala in South India. On the first Indian Independence Day, 15 August 1947, I watched the Union Jack flag come down over my father’s government hospital in Madurai, and the Indian tricolor go up to replace it. There were bands and speeches by my father and by his Indian friend and colleague, Dr. Vadamaliyan, the new head of the hospital. I will never forget 30 January 1948, the somber day when Mohandas K. Ghandi was assassinated. There were tense hours of waiting to see if the assassin had been a Hindu or a Muslim. The atrocities of the partition of India and Pakistan had already been bad enough. Had the assassin been a Muslim, there would have been unthinkable carnage. In 1949, Scotland was overrun with returning colonials like us and still recovering from the damage of World War II. It was hard for my father to find a suitable job, and my mother missed America. So, in 1950 we once again set sail for America with my newborn sister, Elizabeth, named for my Scottish Aunt Elizabeth, a British army nurse who died in Aden. Broken by the war, our family had no savings, and we had to accept help from my mother’s relatives to make ends meet. My father, then almost 50 years old, and a member of the prestigious Royal Society of Physicians and Surgeons, was not qualified to work as a medical doctor in the United States. He was obliged to take off many months to study for medical examinations. He took them with fresh medical school graduates half his age. Not surprisingly, he had the highest exam score. Once my father had his license to practice medicine, he accepted a job to head the public health department in Caldwell County, NC, at the edge of the Blue Ridge Mountains. The area reminded him of his Scottish homeland. It was a wonderful place to go to middle school and high school. To earn money for college, I worked as an assistant to a commercial beekeeper, a physically demanding job, since you had to wrestle 90-lb supers of honey from hives to a pickup truck, all the time being stung by irate bees. A hard day’s work ended with a swim in a turbulent stream rushing through a picturesque mountain cove. My youth in the beautiful mountains of North Carolina deepened my respect for Nature’s beauty, power, and indifference to mankind. I was fortunate to win a Morehead Scholarship to the University of North Carolina in 1956, where I majored in physics. On the advice of my Uncle Karl, I entered graduate school at Princeton University in 1964, where I measured the magnetic moments of radioactive nuclear isotopes in which the f7/2 shell was partially filled. This provided incisive tests for the nuclear shell model, for which Maria Goeppert Meyer received the Nobel Prize about that time. What I learned during my post-doctoral years turned out to be very useful for subsequent work on climate. Several of my Princeton professors had ties to Columbia University, and they helped me get a postdoctoral position there under Bob Novick in 1964. Bob and his colleague, Allen Lurio, introduced me to optical pumping, a way to transfer order from light to atoms or molecules, without the need to make an atomic beam, as I had done in my thesis work. Optical pumping involved subtle details of the interaction of radiation with matter…. one of the key issues in greenhouse warming. What I learned during my post-doctoral years turned out to be very useful for subsequent work on climate. I was also fortunate to meet Barbara Baker, then a nurse at Columbia Presbyterian Hospital, who became my wife and has been a wonderful companion and friend ever since. Our two children, Jim and Gladys, were born in New York City. I was fortunate to be promoted to Assistant Professor, and I took great pleasure measuring previously inaccessible properties of excited atoms with my graduate students and post docs. Although I tried to ignore the Vietnam war, it was becoming an increasingly divisive factor in American life. Keeping up an old family tradition, my brother Ian served as a US army doctor in South Vietnam. But you can’t see many bright stars in the sky at night, and none at all during the day. So, Air Force defenders were going to have a hard time unless their targets were obliging enough to be backlighted by bright stars like Sirius or Vega. By luck, I thought I knew the answer to the problem. It turns out there is a layer of sodium atoms at an altitude of about 100 km above the earth’s surface. The atoms are released when micrometeorites burn up in the atmosphere. I knew from my work at Columbia that sodium atoms had huge scattering cross sections for yellow resonant light…. the same as the light you see if you happen to spill salty water into the flame of a gas cooking stove. So, I proposed that the Air Force invest in a big sodium laser and use it to create an artificial “sodium guide star” just in front of their desired target. I learned a lot about the atmosphere at JASON. I was involved in the analysis of “thermal blooming” of high-power lasers when they are weakly absorbed by H2O and CO2 molecules in the atmosphere. The physics is closely related to that of greenhouse warming. I learned about the physics of the tropopause, where much of the wavefront distortion of starlight or defensive laser beams takes place. I was one of 14 JASON coauthors of one the first books on global warming, with the nerdy title, The Long-Term Impacts of Increasing Atmospheric Carbon Dioxide Levels , edited by Gordon J. MacDonald (Ballinger Publishing Co., 1982). We over-predicted the warming from more CO2 as badly as later establishment models, a topic to which I will return below. I often hear that since I am not a card-carrying climate scientist…. that I, and many other scientists with views similar to mine, have no right to criticize the climate establishment. But as I have outlined above, few have a deeper understanding of the basic science of climate than I. Almost all big modern telescopes use my sodium guidestar to correct for atmospheric turbulence. It works. As we will see below, most climate models do not work. The history of science shows many examples of fields that needed outside criticism. A famous example is Andrei Sakharov’s leadership of opposition to Trofim Lysenko’s politicized biology in the Soviet Union. We will have more to say about Lysenko (right) later in the interview, but one of Lysenko’s main defenses was that Sakharov, a physicist who invented the Soviet hydrogen bomb, was not a “Michurinian” biologist. We understand that you were recently the object of a purported “sting” operation organized by Greenpeace. Defamatory claims about you growing out of this incident are rife on the Internet, even including in your Wikipedia article. Would you care to share with us briefly your side of the story? Greenpeace is one of the many organizations that have made a very good living from alarmism over the supposed threat of global warming. They are unable to defend the extremely weak science. So, they demonize not only the supposed “pollutant,” atmospheric CO2, but also any scientists who seem to be effectively refuting their propaganda. I suppose I should be flattered to be one of their targets: je mehr Feinde, je mehr Ehre (“the more enemies, the more honor”), as the old German saying goes. But my trials pale compared to those of scientists like Willie Soon, Patrick Michaels, and others, who were not only vilified, but driven from their jobs. The smear campaign began in 2015 when I received an email from a Greenpeace operative posing as an agent for a Middle Eastern “client,” who wanted me to write something about the benefits of CO2. As we will discuss below, I have long been persuaded that more CO2 will benefit the world, mainly because it makes plants grow more efficiently and increases their resistance to drought, and because the warming from more CO2, predicted by establishment models, has been exaggerated by a factor of three or more. For years, I have used every avenue possible to spread the good news about the benefits of CO2, so I was quite willing to write an op-ed or essay on this topic for the client. As far as I was concerned, I was using the client, not vice versa. I would urge any reader interested in this episode to read the complete email exchange between me and the Greenpeace operative. It can readily be found on the internet. I would be glad to try to help if my views, outlined in the attachments, are in line with those of your client. The sentence makes it clear that I was only interested in helping the “client” to publicize my long-held views, not to peddle whatever message the “client” had in mind. My activities to push back against climate extremism are a labor of love, to defend the cherished ideals of science, which have been so corrupted by the climate-change cult. If your client was considering reimbursing me for writing something, I would ask that whatever fee would have come to me would go directly to the CO2 Coalition. This was the arrangement I had with the attorneys representing the Peabody Coal Company in the regulatory hearings in Minnesota. The fee I would have received was sent instead to the CO2 Coalition, a 501(c)(3) tax-exempt educational organization. The CO2 Coalition covers occasional travel expenses for me, but pays me no other fees or salary. I have never taken a dime for any of my activities to educate the public that more CO2 will benefit the world. Here you see that I was willing to write something gratis, as a “labor of love,” as long as I could get my message (not the “client’s” message) to more people. The CO2 Coalition that I mentioned is a new tax-exempt educational organization that some friends and I have formed to help get out the good news about the benefits of CO2. I suppose you might call it a “CO2 Anti-Defamation League.” The Coalition leads a hand-to-mouth existence, with an annual operating budget of under $200,000 per year. Even a few thousand dollars from the “client” would help keep the lights on. The last I checked, Greenpeace has an annual operating budget of about $350,000,000, more than 1,000 times larger than the CO2 Coalition’s. I have never taken a dime for any of my activities to educate the public that more CO2 will benefit the world. I even make contributions of several thousands of dollars a year from my modest university pension income. If any readers of this interview would like to help the CO2 Coalition, they can find more information about how to donate at the CO2 Coalition’s website. The result of the Greenpeace smear included many hostile, obscene phone calls and emails with threats to me, my family, even my grandchildren. George Orwell wrote about these tactics in his novel, 1984 , when he described the daily, obligatory “Two Minutes of Hate” for Emmanuel Goldstein (Leon Trotsky) and his agents, who were the enemies of Big Brother (Stalin) and his thugs. Greenpeace and other even more fanatical elements of the global-warming movement fully embrace the ancient lie that their ideological end…. elimination of fossil fuel…. justifies any means, including falsification of scientific data and character assassination of their opponents. First of all, critics claim that the computer models upon which the IPCC’s official position is based are unreliable because of the inherent difficulty of modeling the climate due to the fact that the atmosphere is a fluid-dynamic system, which, like all such systems, is subject to turbulence…. which makes its long-term behavior very hard to predict (turbulence being a form of “sensitivity to initial conditions” or “chaos”). Which side do you come down on with regard to first principles (so to speak) affecting the consensus position on global warming? Let me first respond to the bulleted statements with which you ended your previous section. Yes, CO2 levels have been increasing, at about two parts per million (ppm) per year in recent years. Yes, CO2 is a “greenhouse gas.” That is, it is partially opaque to the thermal, infrared radiation of the earth’s surface, but transparent to most sunlight. Most of the atmosphere consists of nitrogen (N2) and oxygen (O2), which are nearly transparent to both sunlight and thermal radiation, and which are therefore not greenhouse gases. The last bullet “Therefore, the earth’s atmosphere must become warmer” is not very well posed. As you know the atmosphere, does not have a single temperature. The approximate vertical temperature profile of the atmosphere is shown below. Fig. 1. The vertical temperature profile of the earth’s atmosphere. More CO2 is expected to cool the stratosphere and warm the troposphere. The amount of surface warming is likely to be about 1° C for doubling the concentration of atmospheric CO2. Although there are important exceptions, the air is usually warmest near the surface and cools with increasing altitude. A representative cooling rate for the first 10 km or so is about 6.5° C/km. This is why people like to go to the mountains in the summer to get away from the heat. I went to high school in the little Appalachian town of Lenoir, NC, at an elevation of about 400 m, where the temperature was routinely about 8° F hotter than in the resort town of Blowing Rock, NC, at an elevation of about 1,100 m, some 20 miles away on the crest of the Blue Ridge Mountains. The air temperature continues to decrease with altitude until you reach the “tropopause,” about 11 km of altitude over much of the continental USA. This is the top of the churning currents of air in the troposphere below. The churning is driven by solar heating of the surface, not unlike the heating of water in a sauce pan on a stove. Above the tropopause is the stratosphere, where the atmospheric churning stops. On a plane ride across the USA, airliners normally fly just above the tropopause in the lower stratosphere, where there is usually little turbulence, and where the air temperature is on the order of 220° K or -70° F.
Above the tropopause, in the stratosphere, the air no longer cools with increasing altitude. Starting at about 20 km, it begins to warm substantially, and the temperature peaks at about 0° C around 50 km altitude, where the absorption of ultraviolet solar radiation by ozone (O3) causes the maximum temperature rise. The heat from the absorbed ultraviolet light is dumped to space and to the earth below as infrared radiation emitted by greenhouse molecules, mainly CO2, but with some contribution from O3. More CO2 will cool the stratosphere, since more infrared-active molecules are available to radiate away energy. There is less observational support with each passing year for this “positive feedback” on the direct warming from CO2. The troposphere…. the first 11 km of air…. is quite different from the stratosphere. Close to the earth’s surface, much of the heat transfer is by convection of moist air and not by radiation, where more CO2 could make a direct difference. More CO2 will probably warm the troposphere and the earth’s surface. But the magnitude of the warming is very poorly known. My educated guess is that doubling CO2 concentrations will warm the surface by about 1° C and will warm the middle troposphere by about 1.2° C. These are numbers that you calculate from the direct effects of more CO2. The much higher “equilibrium climate sensitivities” quoted by the IPCC, say 3° C for doubling CO2, come from assuming that the relatively small direct temperature increase from more CO2 is greatly amplified by the changes in the properties of water vapor and clouds. There is less observational support with each passing year for this “positive feedback” on the direct warming from CO2. Now let me comment on the IPCC’s four official positions which you mentioned at the beginning of the previous section. Global warming is a well-established fact. This statement is only half true. A more correct statement would be “global warming and global cooling are both well-established facts.” The earth is almost always warming or cooling. Since the year 1800, the earth has warmed by about 1° C, with much of the warming taking place before much increase of atmospheric CO2. There was a quite substantial cooling from about 1940 to 1975. There has been almost no warming for the past 20 years when the CO2 levels have increased most rapidly. The same alternation of warming and cooling has characterized the earth’s climate for all of geological history. It is anthropogenic. No, most of the warming has probably been due to natural causes. But much of the increase in CO2, from around 280 ppm in the year 1800 to about 400 ppm in 2015, is probably anthropogenic, although the warming oceans and land have also released some CO2. The warming of urban areas has correlated well with increasing CO2. This is the well-known urban heat-island effect of expanding cities. But it is not increasing CO2 that causes urban warming; rather, it is the replacement of green fields and forests, with their transpirational cooling, by roads and buildings which do not transpire water vapor. Of course, CO2 levels also increased, along with the urban warming, but the additional CO2 did not cause the warming associated with urbanization. Correlation is not causation! The sun does not rise at dawn because the rooster crows. Over the non-urban areas of the earth, the correlation between CO2 levels and temperature has been poor. Potent natural influences on climate include relatively short-period phenomena changes in ocean conditions like El Niño and longer-period changes like the Pacific Decadal Oscillation, or the North Atlantic Oscillation. Large volcanic eruptions are known to cool the climate for a few years. There is growing evidence that changes in solar activity somehow affect the climate, and there are probably many other influences that we have not yet recognized. Some small fraction of the 1° C warming during the past two centuries must have been due to increasing CO2, which is indeed a greenhouse gas. In equilibrium, the temperature increase should have been ΔT=S log2 (400 ppm/280 ppm), where S is the equilibrium climate sensitivity. Without feedback, the theoretical sensitivity can be calculated to be very nearly S = 1° C, and the base-two logarithm is log2 (400/280) = 0.51. So, the feedback-free warming should have been ΔT = 0.51° C, or about half of the observed warming. The other half of the warming would have been due to natural causes, perhaps related to the recovery of the earth from the “Little Ice Age,” which we will discuss a bit more below. The favored IPCC equilibrium sensitivity is S = 3° C, about three times larger than the feedback-free value of S = 1° C. So, the CO2-induced warming from IPCC models should have been three times larger, or ΔT = 1.54° C, substantially more than the observed warming. To cope with this embarrassing overestimate, establishment models assume that much of the warming has been canceled by aerosol cooling…. for example, by small sulfate particulates from the combustion of high-sulfur coal and oil. Indeed, sulfate particulates from large volcanic eruptions, like that of the Indonesian volcano Tambora in 1815, are known to cause world-wide cooling for several years. But the devil is in the details, and many scientists who have looked carefully at the physics regard the aerosol corrections as largely a fudge factor, invoked by the global warming establishment to avoid admitting the equilibrium temperature rise from doubling CO2 is much less than S = 3° C.
So, the net result of more CO2 will be strongly beneficial for humanity. It is a major problem for humanity. Quite the contrary, more CO2 will be a benefit to humanity. The predicted warming from more CO2 is grossly exaggerated. The equilibrium warming from doubling CO2 is not going to be 3° C, which might marginally be considered a problem, but closer to 1° C, which will be beneficial. One should not forget that the “global warming” is an average value. There will be little warming in the tropics and little warming at midday. What warming occurs will be mostly in temperate and polar regions, and at night. This will extend the agricultural growing season in many countries like Canada, Scandinavia, and Russia. More CO2 greatly increases the efficiency of photosynthesis in plants and makes land plants more drought-resistant. So, the net result of more CO2 will be strongly beneficial for humanity. Concerted global governmental action is required to combat it. In view of the comments above, this is nonsense. Government actions to combat the non-existent problem have blighted the landscape with windmills and solar farms. They have driven up the price of electricity, which has disproportionately harmed the poorest segments of society. Government actions have corrupted science, which has been flooded by money to produce politically correct results. It is time for governments to finally admit the truth about global warming. Warming is not the problem. Government action is the problem. We all know that computer models are only as good as the data we feed into them (GIGO). Yet, it has been claimed that the empirical data relevant to the IPCC’s official position are very difficult to gather, for a number of reasons: the “signal” (the amount of warming claimed, measured in tenths of a degree Celsius) is some three orders of magnitude smaller that the range of the geographic temperature variation, not to mention the normal diurnal and annual temperature variability, over the surface of the planet…. which makes the signal very hard to detect. On top of that, critics often say that the non-random distribution of measuring stations around the world creates still more difficulties in obtaining reliable empirical data. Consensus supporters would say that the signal is well within the range of detection, the global coverage is adequate, and any biases can be detected and compensated for. Could you please comment on the adequacy of the empirical basis for the computer models informing the consensus position? We need to remember the difference between weather models and climate models. Weather models are supposed to tell me whether I can plan a backyard picnic next weekend or whether I need to worry about a damaging frost tomorrow morning. I expect these predictions to be as accurate as possible. Weather models use detailed empirical data about the state of the atmosphere and oceans today to extrapolate its state in the near future, perhaps up to a week ahead. Climate models are supposed to predict the statistical properties of weather: that is, the probability, not the certainty, that it will rain next Labor Day weekend. Climate models work with a much smaller set of empirical input data than weather models. Like weather models, climate models usually take the rotation rate of the earth, the brightness of the sun, the concentrations of CO2, and a few other key variables as empirical input. But climate models do not require the detailed information about today’s winds, pressures, and temperatures that are needed for weather models. For example, details about a “Bermuda high” today are essential empirical input data to let a weather model forecast what my Princeton weekend weather will be. But today’s Bermuda high is irrelevant to the predictions of climate models, which will give the same probability of rain every year at the same date, assuming constant solar radiation, constant concentrations of CO2, etc. A climate model is supposed to predict the probability for the formation of Bermuda highs, not use the Bermuda high as an empirical input. A climate model is supposed to predict the probability for the formation of Bermuda highs, not use the Bermuda high as an empirical input. Both weather models and climate models are based on approximate solutions of the celebrated Navier-Stokes equation for fluid motion on a rotating planet. This equation, and related thermodynamic and radiative transport equations, describe the complicated interplay of gravitation, buoyancy, Coriolis forces, heat release from condensing water vapor, thermal radiation, and other phenomena. Clouds, other aerosols, and the very complicated way the atmospheric opacity depends on the frequency of solar and thermal radiation must all be taken into account, as well. Some of the empirical input data for climate models are very well known…. for example, the chemical composition of the air, the heats of condensation of water, the line spectra of greenhouse gases, the geography of the earth, etc. But many possibly important details are not well understood…. for example, the far-wing spectral line shape of greenhouse gases, the extent to which continuum absorption and line structure contribute to the opacity, the role of solar activity, how cosmic rays influence cloud nucleation, how much contribution to radiation forcing comes from sulfate, black carbon and other aerosols, etc. The compounding effect of many educated guesses, even if each individual guess is physically reasonable, has probably led to the striking exaggeration of warming by climate models. The empirical basis of both weather and climate models could be improved and many excellent scientists are working to bring this about with better laboratory and observational measurements. But I think the main problem with climate models is not the empirical input data. The main problem is that the fundamental equations for the earth’s atmosphere and oceans are too hard to solve with the necessary detail, even for the most advanced computers. Approximate solutions must be devised. These approximate solutions involve many parameterizations that involve human judgment…. AKA educated guesses. Spatial and temporal grid sizes for numerical solutions of the Navier-Stokes equation are an example of such parameters. The compounding effect of many educated guesses, even if each individual guess is physically reasonable, has probably led to the striking exaggeration of warming by climate models. We have heard that this graph is so famous it is simply referred to as “T” (for temperature). T is a very persuasive…. and, yes, scary…. graph, at least to laymen like ourselves. Why doesn’t it just settle the issue of global warming all by itself, once and for all? I’m not sure where your Figure two comes from originally, but so let us use a similar figure from a known source: namely, the recent paper, “Possible artifacts of data biases in the recent global surface temperature warming hiatus,” by Thomas R. Karl et al. ( Science , June 2015, 348: 1469–1472), co-authored by employees of the National Ocean and Atmospheric Administration (NOAA), and therefore with the imprimatur of the US federal government. Fig. 4. NOAA data from the year 2013. NOAA’s data showed a clear pause or hiatus in warming from about the year 2000 to 2013. Responding to this interview in early 2016, I tried to find the temperature record I had used at the Argonne colloquium on the Web, and I discovered that it seems to have been expunged from official NOAA websites, which now have various versions of Figure 3. The hiatus in warming that was clear in the data of 2013 has disappeared! This brings to mind George Orwell’s famous 1949 novel, 1984 , where the hero, Winston Smith, is employed by the Ministry of Truth to rewrite history to conform to the current party line. And then there is Molière’s hero Sganarelle from Le médecin malgré lui [ The Doctor in Spite of Himself ] (1666), who responded to the question of why he had placed the heart on the right side of the human body and the liver on the left, by saying: “Nous avons changé tout cela!” [“We have changed all of that!”]. I recommend that you and your readers have a look at the Climate4you website. Here, you can see not only the data of Figure 2, but also temperature records from other ground-based recording networks, as well as atmospheric temperatures measured by satellites. Fig. 5. The temperature of the lower troposphere measured with satellite-mounted microwave sounding units (MSU). The data came from NOAA’s TIROS-N satellite, and were processed by Dr. Carl Mears of Remote Sensing Systems (RSS). The cooling from the eruption of Mt. Pinatubo in 1991 and the warming from the El Niño events in 1998, 2010, and 2015 are clearly visible. The analysis of satellite data from the competing research group at the University of Alabama at Huntsville (UAH) aware very similar. None of the satellite data sets shows as much warming as Figure 2. In fact, they show almost no systematic warming at all since the year 2000. In contrast to ground stations, which originally used mercury or alcohol thermometers to measure surface temperatures or sea water temperatures at sparse sample locations, satellites measure temperature remotely from orbit over most of the globe by recording the intensity of thermal upwelling radiation at frequencies close to 60 GHz, and with wavelengths of about five mm. These frequencies are strongly absorbed and emitted by molecular oxygen (O2), with more or less intensity if the atmosphere is hotter or colder and if the attenuation rate of the radiation is larger or smaller. The “brightness” at frequencies close to 60 GHz can be measured very precisely with the aid of calibrated blackbodies aboard the satellite. This is a sophisticated version of how a blacksmith judges the temperature of a piece of iron by its color, about 600° C if the iron is dim red, about 900° C if orange, and about 1,100° C if bright yellow. The temporal scanning thermometers used so often nowadays in hospitals work in a similar way with the aid of thermal radiation from the patient’s skin. Satellites do not purport to give surface-temperatures changes, like Fig. two that we discussed earlier, but rather give a characteristic temperature change of the lower troposphere. This is to avoid dealing with the complicated variations of microwave emissivity of the surface itself. Using the brightness of different frequencies near the 60 GHz peak of the O2 emission band, the satellites can estimate the temperature of different atmospheric layers, from the lower troposphere to the stratosphere. Many people have pointed out that models of global warming from more CO2 have predicted much more warming than has been observed over the past decade or two. Almost all climate models predict that the warming of the lower troposphere should be faster than that of the surface, since a warming surface, especially over the 70 percent of the earth that is oceans, will vaporize more water. The condensation of this excess water vapor into clouds releases latent heat (“steam heat”) that causes more warming of the air in the lower troposphere than at the surface. So, from very basic physics, the troposphere should have warmed more (by a factor of about 1.2) than the surface, not less. Fig. 6. A comparison of the warming predicted by climate models with observed warming. You have frequently claimed that the computer models predicting global warming have been falsified as a matter of empirical fact. We take it that you are referring to the so-called “pause” or “hiatus” in global warming over the past 18 years or so, which was not predicted by the models. Is that correct? If so, what would you say in light of the recent study by the National Oceanic and Atmospheric Administration (NOAA) purporting to show that the pause never existed to begin with? Fig. 7. In the original picture on the left, Yezhov is standing between Joseph Stalin and the White Sea canal, built at great cost in human lives with prison labor. On the right is a later version, after Yezhov was executed to make sure he did not expose Stalin’s orchestration of the Great Terror in 1937. For the global warming establishment, the Medieval Warm Period, the Little Ice Age, and the temperature hiatus of the last decade or two were like Yezhov…. a serious embarrassment to the party line, that climate is controlled solely by CO2. The solution was the same as Stalin’s or the Argentine military junta’s: make the embarrassments disappear. I found that those of my friends, who were admirers of Marx, Freud, and Adler, were impressed by a number of points common to these theories, and especially by their apparent explanatory power. These theories appear to be able to explain practically everything that happened within the fields to which they referred. The study of any of them seemed to have the effect of an intellectual conversion or revelation, open your eyes to a new truth hidden from those not yet initiated. Once your eyes were thus opened you saw confirmed instances everywhere: the world was full of verifications of the theory. Whatever happened always confirmed it. Thus its truth appeared manifest; and unbelievers were clearly people who did not want to see the manifest truth; who refuse to see it, either because it was against their class interest, or because of their repressions which were still “un-analyzed” and crying aloud for treatment. Figure five above, from the paper of Fyfe et al. in Nature , says it all. Most establishment climate models are scientifically falsified because they predicted much more warming than was actually observed. And there were dozens of papers in major scientific journals that made the same point. Yet, there is not the slightest evidence that the weather has become more extreme. A good quantitative discussion of extreme weather can be found in John Christy’s congressional testimony [PDF] . Fig. 8. Weather extremes have not increased, even though CO2 levels are steadily increasing. With humble mien will wait for my reward. To read in them the sign of my desire. The world has lots of political and financial Barons who profit in one way or another from hysteria over climate change. And, alas, there are muses in the mass media willing to bring tribute, as well as genius-scientists willing to enslave themselves. Many would argue that, whatever the theoretical and empirical uncertainties surrounding the consensus view on global warming may be, we simply cannot afford the luxury of further study. As with Pascal’s Wager, the stakes are so high that it is far better to act and discover it was not necessary, than not to act and discover it was. If Moses’s God exists, says Pascal, you will be very sorry if you don’t believe in Him. No matter how small the probability, it is better to bet on His existence and act accordingly. A version of Pascal’s Wager I often heard from my Scottish father was Robert Burns’s quip, “An atheist’s laugh’s a poor exchange for Deity offended.” I am not qualified to say more about theology, but if God exists, I hope He will be merciful to believers and unbelievers. Global warming has long since acquired many of the trappings of religion, disguised as science. But let me turn to what is meant by “doing something” about global warming, since it is supposedly “good insurance.” Pascal made major contributions to physics and mathematics of importance to climate science, before turning to philosophy and theology. As far as I know, he was the first to introduce probabilistic or statistical ideas to theology. And the theological context is appropriate, since global warming has long since acquired many of the trappings of religion, disguised as science. Promoters of the “good insurance” argument would have you believe that there is a small but finite risk of catastrophic consequence from more CO2, irreversible “tipping points,” and other doomsday scenarios. This is not true. CO2 levels were thousands of ppm over most of the Phanerozoic eon…. the last 550 million years (when there is a good fossil record of multicellular life), as shown below in the figure from R. A. Berner and Z. Kothvala, “Geocarb III: A Revised Model of Atmospheric CO2 over Phanerozoic Time” ( American Journal of Science (PDF), 2001, 301: 182–204). Fig. 9. The ratio, RCO2, of past atmospheric CO2 concentrations to those (about 300 ppm) of past few million years, This particular proxy record comes from the fraction of the rare stable isotope 13C to the dominant isotope 12C in carbonate sediments and paleosols. Other proxies give similar results. Only once in the Phanerozoic, about 300,000,000 years ago, has the CO2 level been as low as in the recent geological past. Today’s 400 ppm is still a CO2 famine as far as most plants are concerned. During the coldest parts of continental glaciations of the past 5,000,000 years, CO2 levels dropped to 200 ppm or less [J.K. Ward, et al., “Carbon starvation in glacial trees recovered from the La Brea tar pits, southern California,” Proceedings of the National Academy of Sciences of the United States of America , 2005, 102: 690–694], not much above the 150 ppm or so when many plants die of CO2 starvation [J.K. Dippery, et al., “Effects of low and elevated CO2 on C3 and C4 annuals: Growth and biomass allocation,” Oecologia , 1995, 101: 13–20). Life begins to fade at half of today’s CO2 levels, and dies almost completely at one quarter of today’s values. Geological history has demonstrated that life flourishes abundantly at double or quadruple the CO2 levels of today. It is stupid to insure against damage that will not occur if CO2 levels are doubled or tripled. A bet that the toss of two dies will give 13 is still a bad bet, no matter how astronomical the odds. I think that the fact that more CO2 is good, not bad, for the world is the strongest argument against “insurance policies.” But another powerful argument is that “the cure is worse than the disease,” especially since there is no disease at all. I think that the fact that more CO2 is good, not bad, for the world is the strongest argument against “insurance policies.” But another powerful argument is that “the cure is worse than the disease,” especially since there is no disease at all. Today, there is no way for humanity to prosper without using fossil fuels. Quite aside from their high cost, wind and solar farms are of limited use for producing electrical power, because of their unreliability. Solar farms stop working every night and windmills stop working when the wind stops blowing. And neither makes transportation fuel for automobiles or aircraft. China, India, and other less-developed countries are not about to cut their CO2 emissions to pander to the USA and Europe. Over-privileged, ignorant, or cynical western elites are trying force green “insurance” onto their own populations, depriving most of them of meaningful jobs or hope for the future. In the process, they blight once-wide-open spaces with ugly, barely-functional solar farms, and cover once-green hills with noisy, bird-chopping windmills. And even the flawed models, like those of Fig. 6, show temperatures one 100 years from now that are only a few tenths of a degree cooler than they would have been with no insurance at all. This is a protection racket, not insurance. The economic damage to the least-advantaged parts of society from the “insurance” will be real and painful. But the insurance salesmen, like the Laputan professors of Gulliver’s Travels, “instead of being discouraged,…. are fifty times more violently bent upon prosecuting their schemes, driven equally on by hope and despair.” This is a protection racket, not insurance. Let’s move on now to the next set of issues. Assuming for the sake of argument that global warming is indeed a well-established fact, the next question is: What is causing it? Critics say, among other things, that the Hockey Stick cannot possibly be right because it wipes out such well-known phenomena as the “Medieval Warm Period” (c. 1001–1300 AD) and the “Little Ice Age” (c. 1550–1850), as you have already alluded to above. Where do you stand on the Hockey Stick? Could you please explain to our readers what is right or wrong with it, and how (in your opinion) it came to have the significant role it has assumed in the discussion of global warming? The hockey-stick temperature record was conspicuously absent from the latest IPCC report, which speaks volumes. My guess is that the hockey stick started out as an honest but mistaken paper, but one welcomed by the global-warming establishment. They had been embarrassed for years by the Medieval Warm Period, when Vikings farmed Greenland, and when emissions from fossil fuels were negligible. A.W. Montford’s book, The Hockey Stick Illusion (Anglosphere Books, 2015), is a pretty good summary of what happened (see this review). Fig. 11. A 2000-year record of temperature using non-tree-ring proxies. If it disagrees with experiment, it’s wrong. In that simple statement is the key to science. It doesn’t make any difference how beautiful your guess is, it doesn’t matter how smart you are who made the guess, or what his name is…. If it disagrees with experiment, it’s wrong. That’s all there is to it. We are, after all, still recovering from the last ice age (in the true sense of the term), which lasted for about 100,000 years and only ended about 12,000 years ago; therefore, why isn’t modest warming simply what we should expect (the null hypothesis) during an interglacial epoch such as ours? Isn’t the unspoken assumption by consensus scientists that climate change is abnormal blatantly false? Over the geological record taken as a whole, it appears that warming trends regularly precede rising CO2 levels, not the other way around. Some studies show a strong correlation between solar activity cycles and earth surface temperatures; in fact, it was recently predicted that we may be entering a new Little Ice Age in 20 years or so, given that we are due to experience a “Maunder Minimum” (a period of minimal solar activity) at that time; the last Maunder Minimum is thought by some to have contributed to the Little Ice Age. Consensus supporters, of course, would dismiss these concerns as basically irrelevant in comparison with the overriding fact of the rapid increase in atmospheric CO2 concentrations during the past century. How would you balance these two competing sets of concerns? Here, I am reminded of a wonderful scene from the 1939 movie, The Wizard of Oz . Yes, there has been a rapid increase of CO2 in the past century, and it has already made a contribution to increased agricultural production. And yes, there has been warming, about 1° C, but with half the warming occurring before there was much increase in CO2. The erratic nature of the warming over the past century suggests that half or more of the warming is not due to more CO2, but has been caused by other natural phenomena, which have caused warming or cooling over all of geological history. Fig. 12. A comparison calculated summer insolation at 65 degrees north latitude with temperatures inferred from Antarctic ice cores. Interglacials do occur at peaks of northern summer insolation, but some peak insolations had little effect on temperature. Our current interglacial is not as warm as the last one, 130,000 years ago, the Eemian, but it has lasted longer. And you can see why some people are worried that our current interglacial may be approaching an end, since northern summer insolation has dropped dramatically. Figure 13, below, shows temperatures inferred from 18O isotope ratios and CO2 concentrations in ice cores. As you mentioned above, close examination of the temperature and CO2 data shows that temperature changes precede changes in CO2 by several centuries. A possible implication is that warming oceans release dissolved CO2 and cooling oceans absorb it. In the extreme cold just before the start of an interglacial, the ice has large amounts of dust, presumably because of desertification of ice-free areas of continents which permit global dust storms. CO2 concentrations drop to as little as 200 ppm or lower at these dusty times, perhaps leading to partial dieback of land vegetation from CO2 starvation, which would amplify the desertification. Fig. 13. A comparison of temperature inferred from Antarctic ice cores with trapped CO2 and dust. I am glad you mentioned solar activity above. The medieval warm period, the little ice age, and the current warm period are too short to ascribe to orbital changes, but they do suggest some sort of solar influence. A sketch of the Maunder minimum of sun spots that you mention is shown below. Fig. 14. Sunspot frequencies, observed since the year 1600. Almost no sunspots were observed from about 1650 to 1700, a fact first pointed out by the British astronomer Edward Walter Maunder. There are few observations of sun spots before 1600, but it turns out that sunspot frequency is strongly correlated with the cosmic ray intensity at the earth, which in turn, is strongly correlated with the production of the radioactive isotope 14C, the relative abundance of which can be measured with great precision in tree rings. Fig. 15. Relative production rate of 14C for the past 1100 years. Note the inverted scale. The production rate was higher during the Maunder Minimum than at present or during the medieval climate optimum around the year 1000, when the Vikings farmed Greenland..
From inspection of the temperature record (Fig. 11), sunspot activity (Fig. 14), and the 14C production rate (Fig. 15), one can see that the earth’s temperature is very strongly correlated with solar activity, as indicated by sunspot numbers. At times of high solar activity, temperatures are high and 14C production rates are low. The Danish physicist, Henrik Svensmark (“Influence of Cosmic Rays on Earth’s Climate,” Phys. Rev. Letters, 1998, 81: 5027), and the Israeli astrophysicist, Nir J. Shaviv (with J. Veizer, “Celestial Driver of Phanerozoic Climate [PDF],” GSA Today , July 2003, 13: 1–10), have suggested that the physics involves cloud nucleation. Times of high 14C production and few sunspots may well have been more cloudy, since the high background of cosmic rays led to more low cloud cover, reflecting more sunlight back to space and thus cooling the earth. Let us move on now to our third set of issues, namely: even assuming that global warming is a well-established fact and that it is caused by human activity (notably, the burning of fossil fuels), still critics contend that one may legitimately question whether there is much if any reason for alarm due to these facts. The Medieval Warm Period demonstrates that global warming by a few degrees is no catastrophe. Consensus supporters would say that the magnitude of the present anthropogenic forcing must lead to temperature increases that dwarf those of previous historical periods, and moreover will swamp the ability of negative feedbacks to offset the inexorable warming trend. I am persuaded that most of the warming was due to natural causes, about which the governments can do nothing. As I have discussed in detail above, I don’t question that the earth has warmed since the end of the Little Ice Age, but I am persuaded that most of the warming was due to natural causes, about which the governments can do nothing. We are already seeing more vegetation on the earth and it is absorbing more CO2. But as I will discuss in response to your next question, I believe that more CO2 is good for the world, that the world has been in a CO2 famine for many tens of millions of years and that one or two thousand ppm would be ideal for the biosphere. I am baffled at hysterical attempts to drive CO2 levels below 350 ppm, or some other value, apparently chosen by Kabbalah numerology, not science. Now, you go farther than many other critics of the consensus view in stressing, not only that increased atmospheric CO2 concentrations and global warming will be no catastrophe, but that they will even be positively beneficial for humankind. We owe our existence to green plants that convert carbon dioxide molecules (CO2) and water molecules (H2O) to carbohydrates, with the aid of sunlight. One oxygen molecule (O2) is released for every molecule of CO2 incorporated into a carbohydrate. Plenty of oxygen is a boon for most animals. But because of the current low levels of CO2, oxygen seriously limits the photosynthetic efficiency of C3 plants, which include all trees and many important agricultural plants. Land plants get the carbon they need from the CO2 in the air. Most plants draw other essential nutrients…. water, nitrogen, phosphorus, potassium, etc…. from the soil. Just as plants grow better in fertilized, well-watered soils, they also grow better in air with CO2 concentrations several time higher than present values. The current low CO2 levels have exposed a design flaw, made several billion years ago by Nature when she first evolved the enzyme, Ribulose-1,5-bisphosphate carboxylase/oxygenase, or “RuBisCO” for short. RuBisCO is the most abundant protein in the world, and the foundation of all life. Using the energetic molecules, mainly adenosine triphosphate (ATP), produced with the aid of sunlight, RuBisCO, converts CO2 to the simple carbohydrate molecule, 3-phosphoglyceraldehyde (3-PGA). The biochemical machinery of the plant subsequently reworks the 3-PGA molecules into sugar, starch, amino acids, and all the other chemicals of life. The letter “C” in the nickname RuBisCO stands for “carboxylase” in the full name, which reminds us of RuBisCO’s design target: CO2. Geological evidence suggests that RuBisCO began to play its key role in photosynthesis some three billion years ago, when there was lots of CO2 and very little O2 in the atmosphere. At current low levels of atmospheric CO2, plants can use up much of the available CO2 in full sunlight. This CO2 depletion spells trouble for the plant. The letter “O” in the nickname RuBisCO stands for “oxygenase” in the full name, which reminds us that an alternate target of RuBisCO is the oxygen molecule: O2. If RuBisCO, charged with chemical energy from ATP, does not quickly find a CO2 molecule, it will settle for an O2 molecule and produce toxic byproducts…. for example, hydrogen peroxide…. instead of useful carbohydrates. This “photo-oxydation” is a serious problem. At current low CO2 levels and high O2 levels, it leads to a reduction of photosynthetic efficiency by about 25 percent in C3 plants, which include major crops: wheat, rice, soybeans, cotton, and many others. Since 3-PGA, the first molecule synthesized from CO2, has three carbons, such plants are said to have the “C3” photosynthetic pathway. Fig. 16. Evolution designed RuBisCO to catalyze the incorporation of CO2 and H2O into organic carbohydrate molecules. But if CO2 levels are low by the standards of geological history, as they are today, RuBisCO will occasionally use an O2 molecule instead to make various toxic byproducts in the “photo-respiration” process. The basic features of the C3 and C4 photosynthic pathways are summarized in the figure below, from D. Taub, “Effects of Rising Atmospheric Concentrations of Carbon Dioxide on Plants” ( Nature Education Knowledge Project , 2010, 3:21). Fig. 17. The photosynthetic pathways of C3 and C4 plants. In both pathways, CO2 and H2O molecules are fused into carbohydrate molecules with the aid of RuBisCO, the molecule sketched in Fig. 16. The harmful photo-oxidation that limits the efficiency of C3 plants is avoided in C4 plants by isolating RuBisCO in bundle sheaths where it sees artificially high concentrations of CO2 and low concentrations of O2. But the nutritional value of additional CO2 is only part of its benefit to plants. Of equal or greater importance, more CO2 in the atmosphere makes plants more drought-resistant. As indicated in Fig. 17, plant leaves are perforated by stomata, little holes in the gas-tight surface skin that allow CO2 molecules to diffuse from the outside atmosphere into the moist interior of the leaf where they are photosynthesized into carbohydrates. A leaf in full sunlight can easily reach a temperature of 30° C, where the concentration of water molecules (H2O) in the moist interior air of the leaf is about 42,000 ppm, more than 100 times greater than the 400 ppm concentration of CO2 in fresh air outside the leaf. And CO2 molecules, being much heavier than H2O molecules, diffuse more slowly in air. So, depending on the relative humidity of the outside air, as many as 100 H2O molecules can diffuse out of the leaf for every CO2 molecule that diffuses in, to be captured by photosynthesis. This is the reason that most land plants need at least 100 grams of water to produce one gram of carbohydrate. In the course of evolution, land plants have developed finely-tuned feedback mechanisms that allow them to grow leaves with more stomata in air that is poor in CO2, like today, or with fewer stomata for air that is richer in CO2, as has been the case over most of the geological history of land plants. If the amount of CO2 doubles in the atmosphere, plants reduce the number of stomata in newly grown leaves by about a factor of two. With half as many stomata to leak water vapor, plants need about half as much water and will grow better in arid regions of the earth. The following figure by R.J. Donohue, et al., of the Australian Climate Laboratory (“Impact of CO2 fertilization on maximum foliage cover across the globe’s warm, arid environments,” Geophysical Research Letters , 2013, 40: 3031–3035), shows the change in surface vegetation of the Earth from 1982 to 2010 as plants have responded to the modest increase of CO2 from about 340 ppm to 400 ppm during the satellite era. Fig. 18. Greening of the earth between 1982 and 2010 from the increase in CO2. Most of the areas showed a net greening, giving an overall increase of 11 percent. In addition to the work shown here, Ranga Myeni of Boston University and his group find that over the past 30 years, 20.5 percent of the earth’s land area became greener, while only 3percent became browner. The precipitation effects can be separated out by correlating local rainfall with change in vegetation, pixel by pixel. Substantially more greening and greater agricultural yields can be expected as CO2 concentrations increase further. The last issue we wish to take up in this first phase of the interview is the so-called “consensus” that is said to exist among the world’s scientists on the global warming issue. We have been using the term for the sake of convenience and, certainly, it does seem that the majority of scientists, who speak out on this issue, at least in public, tend to support the official IPCC position. On the other hand, the claim that this consensus is “overwhelming” (the figure “97 percent” is frequently bandied about) is often used by proponents to shut down discussion and quash dissent. For this reason, the claim has been subjected to withering criticism by some consensus critics. For example, in their book Taken by Storm (Key Porter Books, rev. ed. 2007), Christopher Essex and Ross McKitrick claim that such a “consensus” exists…. to the extent that it does at all…. only as a result of what they call a “perfect storm,” in which exaggerated claims by NGO partisans (like Greenpeace) are taken up and further exaggerated by the media, leading politicians (who are generally speaking scientifically illiterate) to feel that they must be seen to be doing something, anything, to respond. All of this, they claim, has a chilling effect on scientists who do not necessarily support the consensus view, but who do not say so openly out of self-protection. In this way, the “consensus” becomes a self-fulfilling prophecy. What do you think? Is there a consensus on global warming? Is it overwhelming? If so, is it for the reasons that Essex and McKitrick cite, or for some other reasons? Essex and McKitrick are on target in their book, Taken by Storm . It is striking that many skeptics, like me, are retired. Aside from character assassination, there is not much the attack dogs of the climate consensus can do to us, at least so far. But young academics know very well that they will risk their careers by expressing any doubt about the party line on global warming. Aside from character assassination, there is not much the attack dogs of the climate consensus can do to us, at least so far. Fig. 19. On the left is Trofim Lysenko, who enforced consensus biology in the Soviet Union from the 1920’s to 1964. On the right is the secret-police mug shot of one of Lysenko’s most prominent opponents, Nikolai Vavilov, a brilliant plant geneticist. Vavilov was arrested and condemned to death in 1940. I want to pause here and talk about this notion of consensus, and the rise of what has been called “consensus science.” I regard consensus science as an extremely pernicious development that ought to be stopped cold in its tracks. Historically, the claim of consensus has been the first refuge of scoundrels; it is a way to avoid debate by claiming that the matter is already settled. Whenever you hear the consensus of scientists agrees on something or other, reach for your wallet, because you’re being had. Our last question already began to touch on difficult moral, societal, and political issues, in addition to the strictly scientific ones. Now, let us move into the part of the interview where we address head-on some of the societal issues relevant to the public discussion on global warming. Is concerted governmental action at the global level desirable? If so, what principle of equity should determine that action? When the stakes are very high and a broad scientific consensus is in place, should critics of the mainstream view nevertheless be entitled to express their views freely? Is political advocacy by scientists a good thing in the first place? So, to tackle the first of these, let us begin by pointing out that it is logically possible to acknowledge that global warming is a reality, is manmade, is on the whole a bad thing, and is believed in by the overwhelming majority of scientists…. and nevertheless to feel that the sort of concerted global governmental intervention that is being proposed by the IPCC and the UN Conferences on Climate Change would be a cure worse the disease. One of the main factors which might go into such a negative cost/benefit analysis of action to curtail CO2 emissions versus inaction would of course be straightforward economic costs, and we invite you to address those. How much might it cost is terms of lower global economic productivity to make a dent in the global warming problem (assuming the consensus is correct)? And how would such costs compare to the economic costs of inaction? However, the economic costs of concerted global action to reduce CO2 emissions are not the only ones which must be taken into account. There are political costs, as well…. or at least many would so argue. Now, one’s readiness to assent to the concept of “political costs” will obviously depends upon one’s economic and political allegiances. The threshold of certainty and the level of foreseen harm would need to be much higher for a committed libertarian, for example, than they would for a socialist. We do not wish to ask you directly about your political and economic allegiances (though feel free to share them with us, if you so desire). However, we would like you to address for us the general issue of how one’s political allegiances might affect one’s evaluation of scientific evidence, at least with respect to the official IPCC position and the call for vigorous worldwide governmental intervention. Is concerted governmental action at the global level desirable? No. More CO2 will be good for the world, not bad. Concerted government action may take place anyway, as has so often happened in the sad history of human folly. One example is the Crusades, when the cynical leaders of “Western Christendom” united to punish the peoples of the eastern Mediterranean. The prohibition era in the United States is a more localized example of a silly crusade that turned out badly. A few opportunists will profit handsomely if concerted government action is taken on climate, but most people, and the environment, will suffer. Are our all-powerful governments going to fight increases or decreases of solar activity? Where is Owen Glendower (left) when we need him to “call the spirits from the vasty deep,” or King Canute to stop the tides? I am not keen to submit to lunatic, government-sponsored geoengineering schemes of contemporary Dr. Strangeloves. Nor does driving the earth’s human population down from its current seven billion people to no more than one billion have much appeal to me, even though it is promoted by influential climate advisers of politicians and popes. Are we supposed to draw straws to decide which six out of seven people must disappear from the face of the earth? No action should be taken on CO2. But I enthusiastically support action on real pollution of air, land, or water, by fly ash, oxides of sulfur, and nitrogen from careless coal combustion, or water pollution by careless use of fertilizers and pesticides, or plastic debris in the oceans from human slovenliness. If so, what principle of equity should determine that action? No action should be taken on CO2. But I enthusiastically support action on real pollution of air, land, or water, by fly ash, oxides of sulfur, and nitrogen from careless coal combustion, or water pollution by careless use of fertilizers and pesticides, or plastic debris in the oceans from human slovenliness. I regard the war on the responsible use of coal and other fossil fuels as deeply immoral. It will impoverish most people by raising the cost of energy. It will enrich crony capitalists who have government backing to force people to buy their inefficient, costly, unreliable windmills and solar farms. It is like the French noblewoman, who was told that the peasants had no bread and responded: “Qu’ils mangent de la brioche” (“let them eat cake!”). When used responsibly, fossil fuels release negligible real pollutants like fly ash, oxides of sulfur, nitrogen, etc. The much demonized CO2 that must be released, along with H2O, is actually a benefit to the earth, not a pollutant. When the stakes are very high and a broad scientific consensus is in place, should critics of the mainstream view nevertheless be entitled to express their views freely? Yes! This is the no-brainer answer for a free society, which I and many others will fight for, as our forefathers did. Is political advocacy by scientists a good thing in the first place? Yes! Scientists should be free to advocate on any side of a controversial issue. For example, Andrei Sakharov, one of my heroes, was a passionate advocate of stopping atmospheric testing of nuclear weapons. He was convinced that the radioactive fallout was very harmful to the population of the whole world. My uncle, Karl Morgan, the founding father of the field of health physics, was a passionate, very public, and political opponent of careless exposure of the population to radiation. I turn now to your question about political and economic allegiances. From the end of Reconstruction era after the American Civil War until my college years at the University of North Carolina in Chapel Hill, my ancestral state was dominated by the Democrat party. You could vote for a liberal Democrat, a moderate Democrat, or a conservative Democrat in primary elections, and your candidate might win and then go on to certain victory over the sacrificial Republican candidate. So, when I was old enough to vote, I registered as a Democrat. The few scientists registered as Republicans are more likely to be openly skeptical about the alleged problem of global warming than the much larger number registered as Democrats. All that is completely different today, and North Carolina is one of the few states where both Democrats and Republicans are regularly elected. I have never changed my party registration, but I vote for the candidate of either party who seems most likely to do a good job. It saddens me to see that the party of my youth, the Democrats, have embraced global warming as fervently as Massachusetts Puritans embraced the belief in witches. Both formal surveys and casual observation leave little doubt that the few scientists registered as Republicans are more likely to be openly skeptical about the alleged problem of global warming than the much larger number registered as Democrats. But there are notable exceptions. Ivar Giaever, who won the 1973 Nobel Prize in physics for his discovery of the bandgap in superconductors, and who was an enthusiast supporter of Obama in the elections of 2008, is profoundly skeptical about global-warming alarmism. My Republican friend and colleague, the late D. Alan Bromley, who was the Presidential Science Advisor during the administration of George H.W. Bush from 1988 to 1992, was a global-warming believer who helped persuade the US President to attend the “Earth Summit” in Rio de Janeiro. Assuming for the moment that concerted global governmental intervention is, on balance, required by the situation we are facing, the next problem that arises is the question of fairness or equity. Some principle must be followed for sharing the economic sacrifices that will be required to halt or even roll back atmospheric CO2 concentration increases. Should the developed countries (North America and Europe), which have produced the lion’s share of emissions in the past, bear the brunt of that sacrifice? Or should the countries of the world bear the burden proportionally to their present-day emissions (in which case, China might be penalized as severely as the U.S.)? Or perhaps in proportion to their ability to absorb the economic hit? Or according to some other formula? What, in your opinion, would be a fair way for the nations of the world to share the economic burden that would be imposed by any serious effort to reduce CO2 emissions on a global basis (assuming that such action were rationally mandated)? As I hope I have made clear, I can’t see any reason to reduce CO2 emissions. Doubling or quadrupling current CO2 levels will be good for the world. The economic burdens you talk about are all pain with no gain for most of the world. This brings to mind the Salem Witch trials of 1692, presided over by Harvard-educated judges, the best and the brightest Massachusetts had to offer. When the monstrous hangings of innocent people finally stopped, it was not because the elite admitted there was no such thing as witches. Who would need Harvard-educated ministers if witches did not exist? The trials were stopped for a technicality: the use of “spectral evidence.” If an accuser with good political connections dreamed that the alleged witch consorted with the Devil, that was enough to hang her. I suspect that the more perceptive of the Massachusetts elite realized that the continued use of made-up evidence could soon get out of hand and they themselves could be victims. French revolutionaries guillotined each other a century later. Some of Stalin’s main targets in the great terror of 1937 were his old Bolshevik comrades in arms, who received death sentences based on the equivalent of spectral evidence: wild, fabricated charges of collaboration with the Nazis, etc. The evidence that CO2 is a pollutant so fearsome that we must give up democracy, punish “deniers,” and impoverish much of the world by eliminating the use of fossil fuels is looking more and more like spectral evidence. If you can’t find real scientific evidence for alarm, dream up hockey sticks, dream away hiatuses, and get rid of your opponents as soon as possible. Next is the issue of freedom of speech. You of all people do not need us to tell you that the public conversation on global warming has taken on a decidedly nasty tone. Overt bullying and intimidation are now the order of the day. Most recently, U.S. Senator Sheldon Whitehouse (D-RI) called for the RICO Act against racketeering to be used to prosecute critics of the IPCC consensus! One of the frequent charges (one you are not unfamiliar with personally) is that consensus critics are in the pay of the oil and gas industry. Such critics…. nearly all of whom work for government in one form or another…. do not often stop to consider that they, too, serve someone’s economic interests (as do we all in a society founded upon the free exchange of goods and services). Given this “parity” of interests between consensus critics and supporters, what do you make of the situation? Isn’t the freedom to think what we like and say what we think at the very heart of the scientific endeavor? If so, then how did we get ourselves into this fix? The situation seems to many of us to be truly scandalous…. one that historians of science are going to be making hay out of for decades and centuries to come. Would you agree? Or is it, perhaps, rather all in a day’s work…. merely what we ought to expect whenever science intersects with public policy the way it does in the global warming debate? It is not possible to make progress in science without controversy. It is not possible to make progress in science without controversy. For example, there was heated scientific debate over Alfred Wegener’s theory of continental drift for decades. Stanley Prusiner faced bitter resistance in the early days of his prion theory of mad cow disease and related illnesses, since the theory violated the dogma that the agent for an infectious disease had to be DNA or RNA, and could not be a protein. What is different about the global warming controversy is the direct involvement of governments on one side. As you mention, congressional demands that racketeering charges be brought against climate skeptics are unprecedented in the USA, although this does have an ominous precedent in the Lysenkoism that we mentioned above. Bernie Sanders says he will “bring climate deniers to justice” when he becomes President of the USA. What should people like me expect from President Sanders…. a concentration camp? The firing squad? And what ever happened to the First Amendment to the US Constitution? There are many honest scientists working on climate for the government, some using the ARM facilities I myself helped to emplace when I was at the Department of Energy in the early 1990’s. I admire these scientists and I don’t hold them accountable for the thuggish few who vilify me and others as supposed prostitutes for the fossil fuel industry. During Stalin’s Great Terror, the equivalents of evil fossil fuel interests were Leon Trotsky and his followers. They were a direct threat to Stalin’s control of the world-wide Communist movement, just as climate skeptics are regarded as an existential threat to the global warming establishment. I would be surprised if the net total funding of climate skeptics exceeded $2 or $3 million dollars a year, and even that may be high. In the last few years, US government spending for climate research [PDF] has been about $20 billion dollars a year…. more than a thousand times greater than skeptic funding. But even this huge financial advantage is not sufficient to support the pathetically weak scientific case that the world is in danger from more CO2. Politicians may become lazy and abdicate their responsibility to educate themselves so they can understand the issues themselves. Scientists may compromise the integrity of scientific research itself, to the detriment of its proper functioning when controversial matters arise again in the future. Of course, consensus supporters will note that scientists are citizens, too, and as such have the right (if not the duty) to bring their special expertise to bear on issues of public significance where it is relevant. Also, it must be admitted that there is noble precedent for such scientist-citizen activism…. for instance, the letter addressed by Albert Einstein and Leo Szilard to President Roosevelt in 1939 about the possibilities of building an atomic bomb. How do you feel about this issue? Do scientists who intervene in politics short-circuit the democratic process by absolving politicians and citizens of the obligation to inform themselves on scientific matters of public import? And what risk, if any, does such activism pose for the future of science itself? We have already touched on most of the issues you mention above. I think that great damage has been done to the reputation of all of science by the global-warming frenzy of the past few decades. Twenty years ago, supposedly expert scientists solemnly declared that our children and grandchildren would not know what snow is. A few weeks ago, Washington, DC, struggled to dig out of three feet of snow, a record in many locales. In accepting his 2007 Nobel Peace Prize (also won by Yassir Arafat), Al Gore said the summer Arctic could be ice-free by 2013 due to CO2 emissions. I invite readers to have a look at the data site I mentioned earlier. A few minutes of inspection of the “sea ice” link will show that there has been no significant change in sea ice since 2007. With all due respect to Nobel Laureate Gore, there was plenty of summer ice in 2013. I hope that when the global-warming scandal is finally behind us, science will be forgiven for letting it fester so long. It took decades for Soviet biology to recover from the damage done by Lysenkoism. Finally, we would like you to tell us…. in bulleted list format, if you like…. what you consider to be the five strongest arguments against the consensus view, as well as the five weakest arguments that supporters commonly advance in favor of the consensus view. Climate models have predicted far more warming than has been observed, as shown in Fig. 6. This is strong evidence that the equilibrium temperature increases from doubling CO2 levels is not 3° C to 3.5° C, as assumed in most climate models, but much less, probably close to 1° C.
The consensus has largely ignored the huge positive effects of more CO2, as illustrated in Fig. 18. The large temperature changes of the Medieval Warm Period and the Little Ice Age occurred before the widespread use of fossil fuels after the industrial revolution, as shown in Fig. 11. There is a strong correlation of temperature with solar activity as shown in Fig. 12, 14, and 15. Frenzied, ad hominem attacks on credible opponents show that consensus supporters have a very weak scientific case. You don’t need potentially counterproductive ad hominem attacks if you have strong scientific arguments. Ninety-seven percent of scientists agree with the consensus. Temperature has increased for the past century and CO2 levels have increased. Therefore the temperature increase was caused by CO2. Government funded, consensus-supporting researchers have no conflict of interest. Scientific opponents of the consensus are prostitutes of the evil fossil fuel industry. Trump consults William Happer on climate change. Thank you very much for sharing your views on global warming with our readers. We look forward to the upcoming Focused Civil Dialogue between you and Professor Karoly, to be published soon here at TheBestSchools.org.